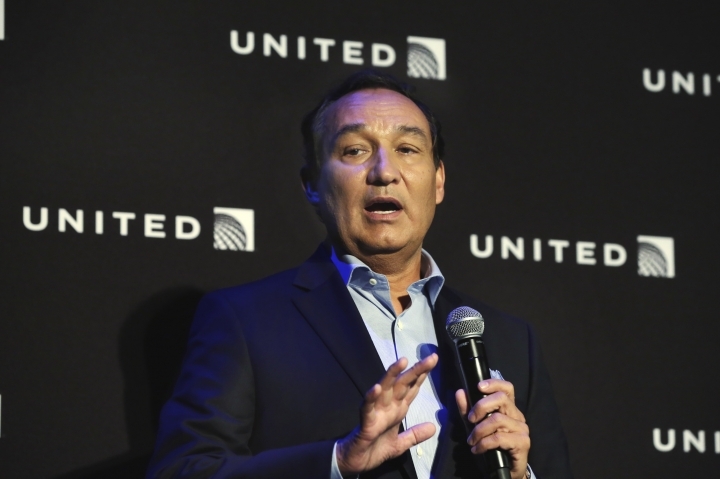 NEW YORK — United Airlines CEO Oscar Munoz has made his first major management changes, appointing two new people to top leadership positions. The airline said Thursday that Andrew Levy will serve as the new chief financial officer of United Continental Holdings Inc. and Julia Haywood as the new chief commercial officer. Gerry Laderman, who has been serving as acting chief financial officer, will continue in his previous role as senior vice president, finance, procurement and treasurer. Jim Compton, who currently serves as chief revenue officer and vice chairman of the Chicago-based airline, will retire at the end of the year. Compton started at United in 1995. Haywood's role will be the same as Compton's but with a different title. Munoz has been CEO since September, tasked with turning around the underperforming airline. In his brief tenure, Munoz has reached a critical new contract with flight attendants, improved the airline's on-time performance and won back some crucial high-spending business travelers. Levy was previously the president of Allegiant Travel Co., the parent company of low-cost carrier Allegiant Air, and spent more than 13 years working for the airline. Before that, he was director of contracts for discounter ValuJet Airlines. At Allegiant, Levy was part of the leadership team that transformed the airline into one of the world's most profitable carriers. It started out focusing on routes that nobody else did: small, underserved cities to sunny vacation spots. And Allegiant is a pioneer in fees, charging extra to book flights online, or to use a credit card. Selecting a seat in advance costs extra as does a bottle of water. Joseph W. DeNardi, an analyst with Stifel, called the addition of Levy a "positive for United" that will help the airline better understand — and compete — with ultra-low-cost airlines. United is set to rollout a new bare-bones fare class soon to compete with Allegiant and Spirit Airlines on some routes. DeNardi said in a note to investors that he would not be surprised if those new fares from United include a new fee for carry-on bags. (Allegiant and Spirit charge to use the overhead bins.) United has released no details of the fare but Delta Air Lines, which rolled out its own bare-bones fare, does not charge for carry-on luggage. Haywood joins United from The Boston Consulting Group, where she served as partner and managing director. Most recently, she worked closed with United on transforming its revenue and network.